When it comes to a musical theatre audition, there are so many variables that are out of your control. You can literally drive yourself crazy with questions/worries. WAIT – WHAT WAS THAT LAST QUESTION??? That, my friend, has a lot to do with how well you set your accompanist up to succeed. Do yourself a favor and read the following lists before you go to your next musical theatre audition. 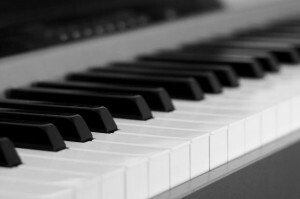 And, check my next post for tips on the best ways to set your accompanist up to help you succeed. 1. is a PERSON (not a ROBOT) who has been sitting there all day playing short clips of songs for several people he/she has probably never met. 2. might also be the music director or good friend of the music director or someone else who is really important. 3. most likely wants you to do well. 5. would love it if you spoke slowly and clearly so that he/she can understand you. 6. probably doesn't like being snapped at, a gentle tapping of your tempo while you singing a bit of your song seems much less pushy. 7. might have never heard the music you are asking them to play. 8. might start playing your music before you are ready unless you tell them when to play. 10. is curious just like the rest of us and might go through your book, so don't leave anything you don't want them to see tucked inside.